In recent years, the potential to improve cognitive skills through training has captured the attention of academic researchers, the commercial market, and the general public. Numerous clinical and healthy populations have been identified as targets for cognitive training, and military personnel are one particular group that may be able to uniquely benefit from cognitive training interventions. Military operations involve a wide range of human performance skills, many of which are cognitive in nature. Use of cognitive training to improve these critical everyday skills for service members represents an untapped potential resource by which to improve operational readiness and warfighter performance. While much of the cognitive training research to date has been circumscribed within basic science pursuits, here we propose ways in which this research may start to be applied in a military setting. In the current review, we examine instances of military operations that may readily lend themselves to cognitive training. Further, we examine the existing literature from academic endeavors and pinpoint areas of exemplary efforts that can serve as a guide for military research to follow, as well as pitfalls to avoid. In particular, we identify and review evidence from the video game, working memory, and executive function training literatures. Finally, the goals of basic and applied science often differ, and that is certainly the case when comparing outcome-based research in a military context with mechanism-based research in an academic context. Therefore, we provide a guide for best practices when conducting cognitive training research specifically in a military setting. While cognitive training has attracted much controversy in both academia and commercial markets, we argue that utilizing near transfer effects in a targeted, outcome-based approach may represent a powerful tool to improve human performance in a number of military-relevant scenarios. This work was supported by an Office of Naval Research award H1602 to ATB. LT Adam T. Biggs is a military service member. This work was prepared as part of his official duties. Title 17 U.S.C. §105 provides that “Copyright protection under this title is not available for any work of the United States Government.” Title 17 U.S.C. §101 defines a U.S. Government work as a work prepared by a military service member or employee of the U.S. Government as part of that person’s official duties. Dale, G., & Green, C. S. (2017). The changing face of video games and video gamers: future directions in the scientific study of video game play and cognitive performance. 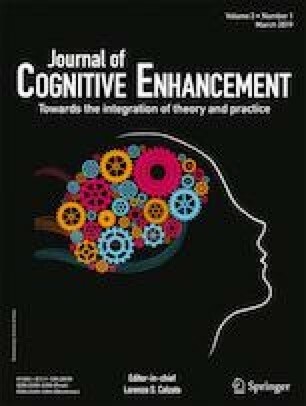 Journal of Cognitive Enhancement, 1–15. https://doi.org/10.1007/s41465-017-0015-6. Jaeggi, S. M., Buschkuehl, M., Jonides, J., & Perrig, W. J. (2008). Improving fluid intelligence with training on working memory. Proc Natl Acad Sci U S A, 105(19), 6829–6833. https://doi.org/10.1073/pnas.0801268105. Li, R., Polat, U., Scalzo, F., & Bavelier, D. (2010). Reducing backward masking through action game training. Journal of Vision, 10(14). https://doi.org/10.1167/10.14.33. Schmiedek, F., Lovden, M., & Lindenberger, U. (2010). Hundred Days of Cognitive Training Enhance Broad Cognitive Abilities in Adulthood: Findings from the COGITO Study. Front Aging Neurosci, 2. doi: https://doi.org/10.3389/fnagi.2010.00027. Sherlin, L. H., Arns, M., Lubar, J., Heinrich, H., Kerson, C., Strehl, U., & al., e. (2011). Neurofeedback and basic learning theory: implications for research and practice. Journal of Neurotherapy, 15, 292–304. doi: https://doi.org/10.1080/10874208.2011.623089. Unsworth, N., Fukuda, K., Awh, E., & Vogel, E. K. (2014). Working memory delay activity predicts individual differences in cognitive abilities. Journal of Cognitive Neuroscience, 1–13. https://doi.org/10.1162/jocn_a_00765.